The CKC Lure Coursing Council has been working alongside CKC Head Office personnel to create the Chase Ability Program (CAP) to provide all purebred and mixed-breed dogs a chance to earn a participation title in a field event. The proposed rules for the event were passed at the September CKC Board of Directors meeting and the program is scheduled to commence March 1, 2016.
Who can compete? The Chase Ability Program is open to all purebred and mixed-breed dogs who are at least 12 months of age. 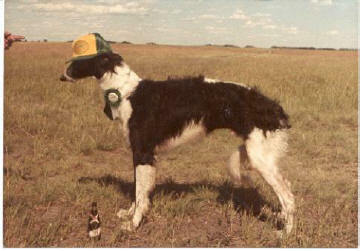 Participants must be individually registered with the CKC; or have an Event Registration Number (ERN); or have a Performance Event Number (PEN); or eligible for registration with the CKC (called Listed and an additional event fee paid to the CKC); or have a Miscellaneous Certificate Number (MCN) if it belongs to a CKC listed breed; or have a Canine Companion Number (CCN) if it’s a mixed-breed. What is involved? There shall be two course lengths, 300 and 600 yards (273 and 545 meters). The short course shall be for dogs shorter than 12 inches at the withers and/or brachycephalic (flat-faced) dogs). The long course shall be used by all dogs not eligible to run the short distance. A course shall be designed with the safety of participants as a high priority. Here is an example of a possible field layout. The 300 yard course would be either the outside loop starting at the S/F mark clockwise to the second diamond or the inner loop going counterclockwise again to the second diamond. Dogs running the longer distance would run both loops. CAP is a pass/fail event. Dogs should complete the course with enthusiasm and without stopping to “smell the roses” and MUST run by themselves. Make sure that your dog is in peak condition. Each event will have an inspection committee responsible for ensuring the fitness to compete of each entry. They will inspect each entry for lameness, fitness to compete and females in season (even if spayed). If you are running girls, get them used to having a stranger wipe their private parts with a tissue. If an entry fails to pass inspection, they will not be allowed to compete and entry fees will be refunded. What will an Event Cost? This is not a Fun Run or practice. All of the expenses to a club associated with a CKC event apply to a CAP event. There is a CKC title involved and it is very likely that fees will be on a par with what clubs charge to enter a Lure Coursing Field Trial. So that exhibitors don’t experience “sticker shock”, consider this fair warning that each club will set the entry fees for events they host. For our club, that could be $20/dog for pre-entry and $25/dog for day-of entries, with a possible discount for multiple entries by the same owner pre-entry only. It will be cost effective to pre-enter these events. What else can I do? Clubs are always looking for fields to run their trials on and this will be no exception. For those of you who have been coming to Foothills Gazehound Club practices, the field we use is too small for a CAP run we can barely get 600 yards in it and that requires several crossovers. It’s about two acres and if we were to get an entry of 75 dogs there is not enough parking available. Ideally the field should be 10 acres, flat and well fenced. Community Associations, schools, Riding Arena pastures, Rodeo Grounds anywhere that YOU would feel safe running you dogs. Our area of operation currently is within 50 miles (80 kilometers) of the City of Calgary limits, and that is a big area. Keep your eyes open. Let us know if you find something suitable. Looking forward to hosting CAP events for all those lure crazy dogs out there.